Powell was nominated for both this and Shakespeare in Love in the same year. She won for Shakespeare, but the clothes in Goldmine are just as stunning to me. The film was also her first with Haynes. 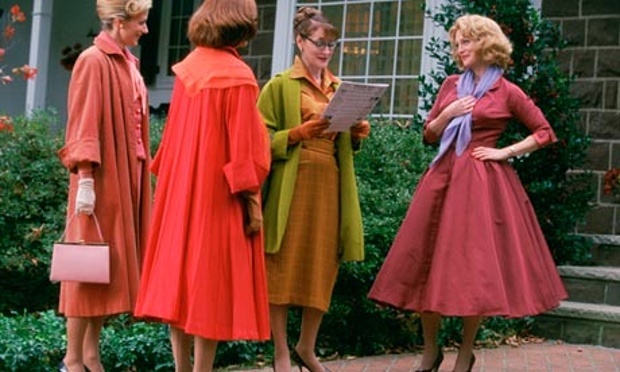 Haynes was famously inspired by Douglas Sirk’s All That Heaven Allows and to match the intense Technicolor hues, indicated Pantone color palettes for each scene to Powell and production designer Mark Friedberg. 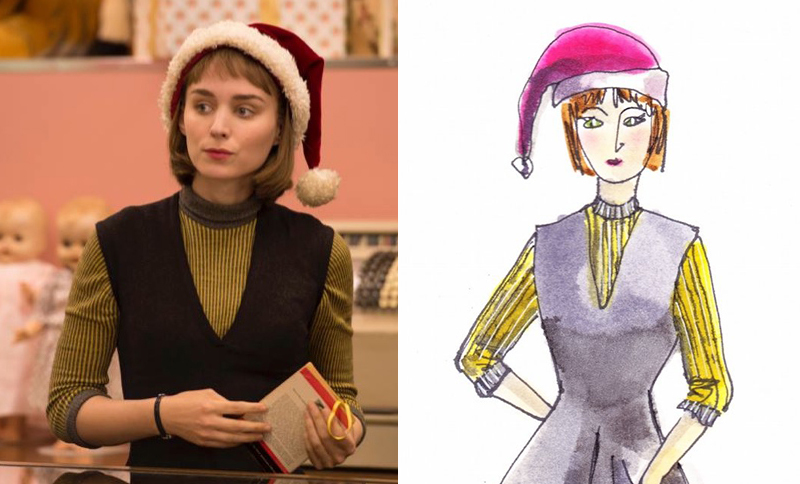 Powell’s designs, as noted above, won her an Oscar, a well-deserved one, as each character was a fairly well-known personage. Casting is part of the magic but the clothes are always appropriate. 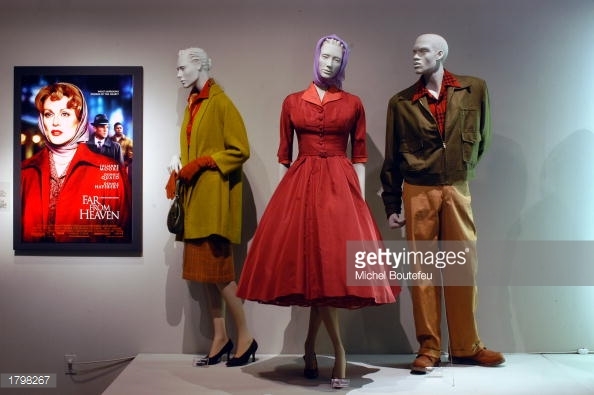 The designer also showed Howard Hughes’ growing mental distress with a progression from custom-tailored suits and shiny shoes to off-the-rack suits and tennis shoes (after Katharine Hepburn leaves him) to, well, not a stitch, as he descends into complete paranoia. 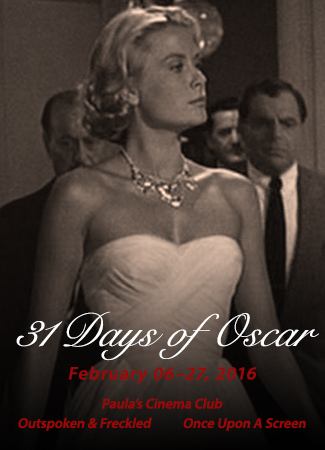 This post is part of The 31 Days of Oscar Blogathon, hosted by myself at Paula’s Cinema Club, Kellee at Outspoken and Freckled, and Aurora at Once Upon A Screen. Week 3 is dedicated to THE CRAFTS, check out the other posts here. 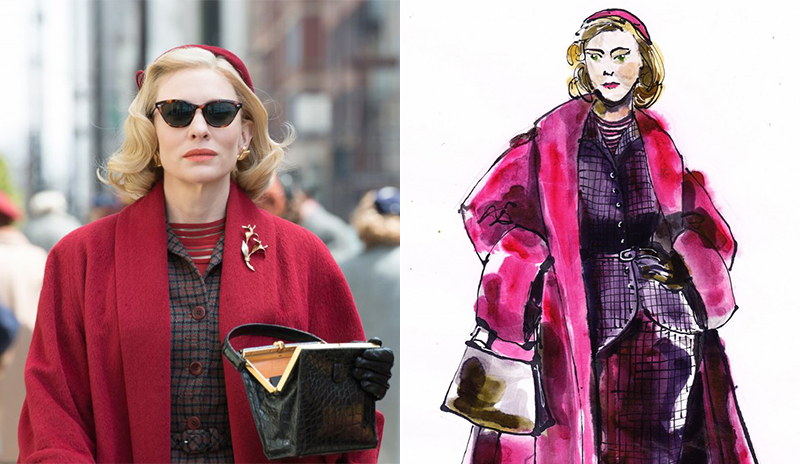 Posted on 21 February 2016 21 February 2016 by PaulaPosted in FeaturesTagged 2010s, 2015 films, 2016 academy awards, Academy Awards, academy of motion picture arts and sciences, Best Costume Design, carol, cate blanchett, cinderella, costume design, far from heaven, gwen stefani, josie maran, julianne moore, kate beckinsale, leonardo di caprio, martin scorsese, neil jordan, Oscars, rooney mara, sandy powell, the aviator, todd haynes, velvet goldmine. Oh I LOVE Sandy Powell’s work!! 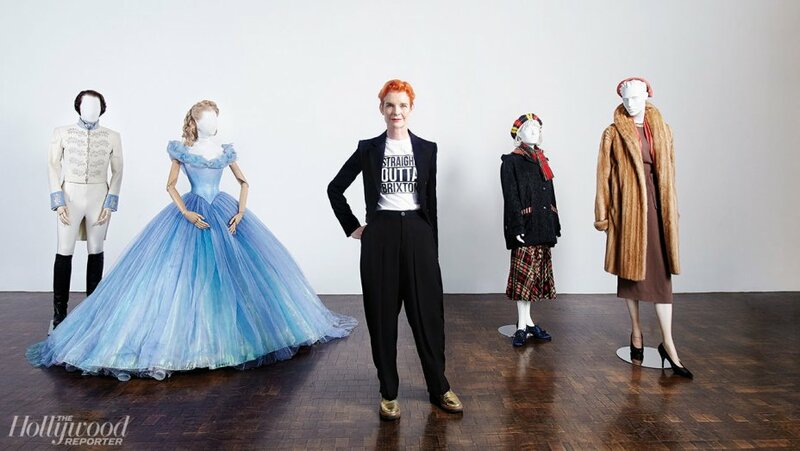 I especially love her work in Cinderella, and my faves are actually the costumes worn by Cate Blanchett, more so than Cinderella’s own ball gown. Wonderful tribute here Paula, awesome stuff! Thanks Ruth! I’m more familiar with CAROL but this post would have been a lot longer if I’d gone into more details. I really want her to win for either film, but she might split her own votes…sigh. I hope she does! But yeah I guess that is the conundrum of being double-nominated. She’s a winner regardless though. Btw, I just reviewed Trumbo & Hail, Caesar that are both set in the golden age of Hollywood, have you seen either one? Yes I agree about Cranston and O’Gorman who played Kirk Douglas! I’m curious what you’d think of Hail, Caesar. 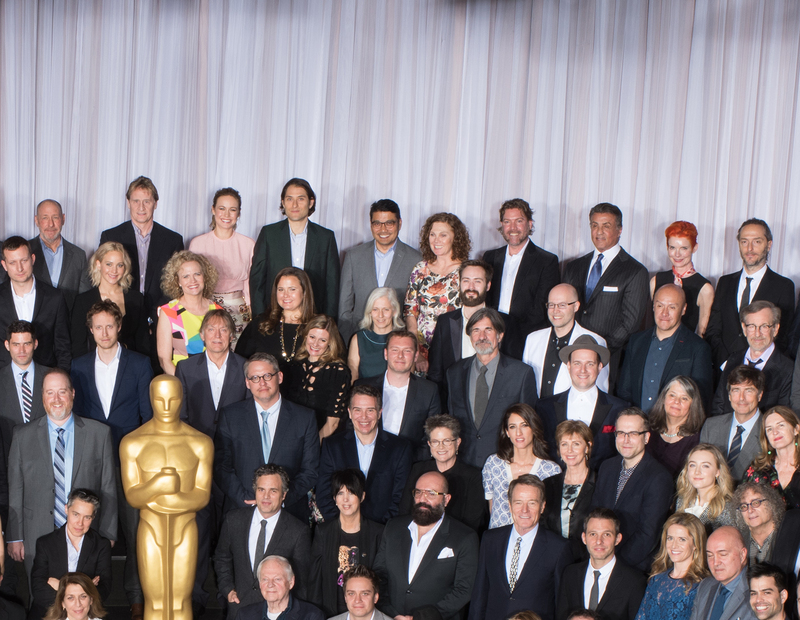 😀 I will probably write a post about it…without even reading much about it, I see Gene Kelly (Channing Tatum), Esther Williams (Scarlett Johansson), Louella Parsons/Hedda Hopper (Tilda Swinton), and I believe Clooney’s character is a mash-up of a few different OH actors.